but also make a perfect personalized photo mug for any occasion! Most everybody used coffee mugs, so what better way to keep your company logo in front of your customer then through our company logo coffee mug. Color enhanced company logo coffee mugs create a non traditional full color print photo mug that can even be personalized with your employee or customer's name. Because there are never any minimums to order, these color trim mugs make a great photo gift for that special someone. The 11oz company logo coffee mugs make a perfect size for sipping your favorite hot beverage and for those who like a large personalized company mug, choose our 15oz size. Unlike other print technology such as traditional screen printing, which lays the inks on the outer surface; these logo coffee mugs are printed using our unique dye-sublimation process which actually embeds your personal message, logo or photo into the surface of this company logo coffee mugs. These photo mugs are available in your choice of 10 color schemes. 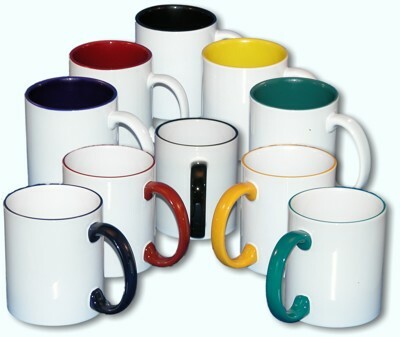 The company logo mugs come with maroon, navy blue, black, yellow or green interiors or with a colored handle and rim. We can produce a single personalized photo mug for a gift or other keepsake or we can produce hundreds of logo mugs for that special event or promotion. Custom printed in full color to order with your logo and/or text. No minimums to order. Even volume orders can be individually personalized (print a different name on each of this company logo coffee mug) for no extra charge.